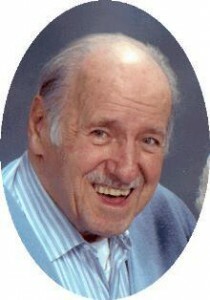 Gerald L. Reiherzer, 79, of Garfield Avenue, Port Washington, died Monday night, January 12, 2004 at his home. Gerald was born January 2, 1925 in Milwaukee, Wisconsin to Alois and Hilda Chesak Reiherzer. He met Lenor Maynard of Prairie du Sac, Wisconsin and married her October 11, 1947 at Holy Redeemer Catholic Church in Milwaukee. Mr. Reiherzer worked for Wisconsin Electric Power Plant in Milwaukee and Oak Creek. He was moved to the Port Washington Plant and moved to Garfield Avenue in Port Washington in the 1950’s. He worked as a Mechanical Supervisor there for over 38 years and retired in 1985. He was a member of the International Association of Operating Engineers, Local 317 and the Knights of Columbus Ozaukee Councin 2035. He enjoyed playing sheepshead, bowling and golf. Mostly he was a handiman who could fix anything in and around the house. Gerald is survived by his wife, Lenor and 5 children, Gail (Charles) Rupiper of El Paso, TX, Mike (Renee) Reiherzer of Newburgh, IN, Jill (Clarence) Sanem of Oostburg, WI, Lori (Chuck) Demge of Menomonee Falls, WI and Lee (Denise Lanthier) Reiherzer of Oshkosh, WI. He is further survived by 8 grandchildren, 3 great grandchildren, brother Al (Rosemarie) Reiherzer of Elkhorn, WI orther relatives and friends. Preceded by one sister and four brothers. Mass of Christian Burial 6 PM Friday, January 16, 2004 at St. Mary’s Church, 430 Johnson Street, Port Washington. Fr. Allan Sommer will celebrate. Interment parish cemetery. NO VISITATION, please meet at church. Memorials to St. Mary’s Church appreciated.